Hello world. I'm in the middle of completely overhauling my portfolio. I am interested in cosplay shoots at the moment, and only offering trade shoots for cosplay. 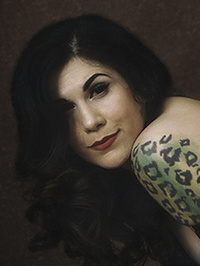 If you are a photographer interested in pinup, tattoo modeling, figure modeling, etc, please contact me for my rates. If you would like to shoot one of my cosplays, please see my casting call in that section. I am very stingy about trade, and have a particular style I am looking for in these photos, so please don't be offended if I do not respond. I am a full time burlesque actor/performer/model/show producer/hairstylist. I am also a competitive archer (yes, as in arrows) so I do not have a lot of free time. ...and hoping to do much, much more! ...and there's typically a photo of me in a Time Out New York once a month, if not more. Flip Magazine August 2015: I'm all over this thing! Worked with Minnie dMoocha? Share your experience and become verified! If you ever need a high-end retoucher I'll be happy to give you a discounted rate for your first image. Looking forward to hearing from you!